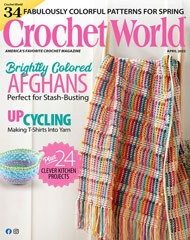 Crochet this vibrant afghan in as many or few colors as you have on hand. It's a great scrap project stitched in worsted weight yarn with a size G crochet hook. Size: 66" x 75".